"The main premise of detective criticism is this: many of the murders narrated in literature were not committed by the people accused by the text. In literature, as in life, the true criminals often elude the investigators and allow secondary characters to be accused and condemned. In its passion for justice, detective criticism commits itself to rediscovering the truth. If it is unable to arrest the guilty parties, it can at least clear the names of the innocent." This is literary criticism like you've never read it. When I picked up this book, I thought it was a fan fiction approach to Sherlock Holmes. What I ended up reading was an entertaining, thought-provoking and convincing argument that Sherlock Holmes did not solve The Case of the Hound of the Baskervilles. Written in a casual, easy-to-read style, Sherlock Holmes Was Wrong is broken into 3 short sections. 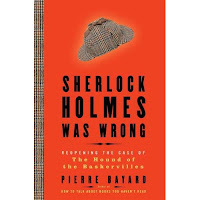 In the first, Bayard points out Holmes's mistakes and builds a case for Stapleton's innocence (Holmes concludes that Stapleton is guilty at the end of The Hound of the Baskervilles). In the third section, Bayard turns back to the case at hand and points a finger at the "real" murderer. I started this book and couldn't put it down. There were some typos (it was translated out of the original French) and shameless self-promotion by the author, which bothered me, and the detour in the second section was slightly longer than I would have wished, but those are the sole objections I can make to this book. Part literary deconstruction, part imagination, and part pure genius, this book must be read by anyone who takes the slightest interest in criticism--you will never look at any book the same. Besides, if you don't read it, you'll never know what really happened in The Hound of the Baskervilles; I'm certainly not going to tell you! Sidenote: I talked about the PBS series Wishbone in a recent post, but wasn't able to find the clips I wanted, so for this post I have included the Wishbone re-telling of Arthur Conan Doyle's The Hound of the Baskervilles. Obviously, this is a more traditional interpretation of the story than Bayard presents. Enjoy! I really love when something like that happens to me. It's not what I thought and it turns out to be better. I may have to check this one out. I am so glad that I stumbled upon your blog! I am thinking of teaching The Hound of the Baskervilles this semester and this will be a GREAT resource for me. I plan to check it out this weekend!! Thanks for stopping by! If you'd like to drop me a line, my e-mail address is meh471 (AT) gmail (DOT) com. I'd love to hear from you! ATTENTION AUTHORS AND PUBLISHERS: Check out my reviewing policy here! Is Your Blog Written by a Man or a Woman? THE CHERRY HARVEST by Lucy Sanna is available now! Mailbox Monday – my first one!